What is Notice of Commencement of Case? What is a Discharge Notice? What "exempt" properties are debtors entitled to from sale of the Trustee? What options does a debtor have in regards to secured consumer debt? Can Utility Utility Debts Be Discharged in bankruptcy? Does the Bankruptcy Code prohibit discrimination based on a bankruptcy filing? 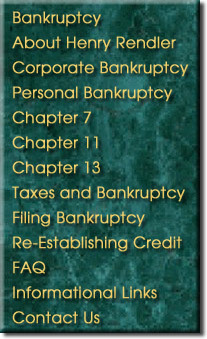 What is a Chapter 13 Bankruptcy plan? Are Chapter 13 Plans are Based on the Debtor’s Income and Assets? The court appoints a bankruptcy trustee, whose job it is to review the bankruptcy filing, conduct the meeting of creditors, review the debtor's eligibility for a discharge, liquidate (sell) any non-exempt assets, and distribute the proceeds to creditors under a distribution scheme set forth in the Bankruptcy Code. Usually within 1 to 2 weeks after the bankruptcy filing, the bankruptcy court clerk will send out a notice to all creditors, the debtor and the debtor's attorney. That notice provides a myriad of important information, including the fact of the commencement of the case, the case number, a description of the automatic stay, the date set for the meeting of creditors, the deadline for filing complaints objecting to dischargeability of debts and the discharge of the debtor, the identity of the debtor's lawyer, the identity of the bankruptcy trustee, whether or not creditors should file claims with the court, and if so, the deadline for the filing of such claims. Typically, creditors are given 90 days from the bankruptcy filing within which to object to the debtor's discharge or to the dischargeability of a particular debt. The debtor is required to attend a meeting of creditors, also known as a Section 341 meeting. The meeting typically is held about 1 month after the filing of the bankruptcy, and is conducted by the trustee rather than the bankruptcy judge. The debtor is put under oath, and the creditors have the right to ask the debtor about the debtor's assets and liabilities. In most cases, the creditors do not bother to appear at the meeting of creditors, and the questioning is done by the trustee. In most instances, the meetings are quite brief, and often limited to the debtor simply confirming that the bankruptcy papers contain a true and accurate listing of all of his assets and debts. If complications arise, such as litigation with a creditor or the trustee, the debtor may have to attend a court hearing or additional examinations, and he will receive such notice from the court or his attorney. If there are no objections to the debtor's discharge, then the debtor receives a written notice from the court, entitled "Discharge of Debtor", stating that he has been discharged of all of his dischargeable debts. The discharge notice is usually sent out within or week or two after the expiration of the deadline for filing complaints. What assets are debtors entitled to exempt from sale by the Trustee? A debtor filing bankruptcy in California can choose between 2 different menus, or slates, of exemptions, generally referred to as the "federal" and "California" exemptions. These exemptions include, for example, equity in an automobile, a homestead, basic household furniture and furnishings, certain interests in jewelry, tools of the trade, life insurance policies and retirement plans, disability payments, personal injury causes of actions, and other exemptions. In claiming the exemptions, the items are typically valued at their current fair market value, and not their original purchase price. Also, the value of an item is reduced by the amount of any loan (secured claim) that may exist against said item. If there are no objections to the debtor's claim of exemptions within 30 days after the completion of the meeting of creditors, the exemptions are typically allowed (approved) as a matter of course. If the debtor has consumer debts which are secured by property of the estate, then the debtor has several options, which typically must be exercised within 45 days after the bankruptcy filing, and which is reflected in a paper filed with the bankruptcy court called "statement of intention"
Avoid (cancel) the lien, with the debtor keeping the property and making no further payments. This typically can be done only in cases where the debtor has put up household goods as collateral for a loan (other than a loan to purchase the goods). Also, it sometimes is possible for the debtor to keep the collateral, keep making the payments, and not officially reaffirm the debt. In this instance, if the debtor defaults, the secured creditor will have the right to proceed with repossession of the property, but will not be allowed to hold the debtor personally liable if the property is not of sufficient value to pay off the debt. Can Utility Debts Be Discharged in bankruptcy? Public utilities, such as the gas and electric company, are not permitted to discontinue service because of a bankruptcy filing. However, if the utility bill is included in the bankruptcy and not paid, then the utility has the right to demand that the debtor pay a deposit within 20 days to ensure the continuation of service. Sometimes, the requested deposit is several times the amount of the bill, so it often makes sense for a cash-strapped debtor to simply pay the bill. Utility bills for service arising after the bankruptcy filing are not included in the bankruptcy, and must be paid. The Bankruptcy Code contains an "anti-discrimination" provision, stating that government units and private employers may not discriminate against a person solely because that person has filed bankruptcy or was insolvent. Also, if a debtor has lost his driver's license solely because of his inability to pay damages resulting from an accident, then a bankruptcy discharge will allow the debtor to get his license back. The fact that a debtor has filed bankruptcy can appear on credit reports for 10 years. If the debtor was delinquent in his bill payments, then he may have already had bad credit prior to the bankruptcy. If the debtor receives a discharge of his debts, then he will often be in a good position to pay his current bills, and may be able to get new credit. A debtor is entitled to receive a discharge in bankruptcy once every 6 years. Chapter 13 bankruptcy is a court-supervised debt adjustment procedure, available for individuals with regular income, who have unsecured debts totalling less than $269,250 and secured debts totalling less than $807,750. The Chapter 13 debtor files a bankruptcy petition which is virtually identical to the Chapter 7 petition, including a detailed financial statement and listing of assets and liabilities. The filing fee for the court is $185. In addition, the debtor typically pays his attorney some portion of the total agreed-upon fee in advance. The Chapter 13 debtor files a "plan", which provides for repayment of debts over a 3-5 year period. The plan is usually a form, one page in length. The court appoints a Chapter 13 trustee, whose job it is to receive payments from the debtor, and to disburse funds to creditors. The Chapter 13 trustee acts basically as a disbursing agent, and not as a liquidating trustee. The debtor remains in possession of all of his property, exempt and non-exempt. Upon completion of payments under the plan, the debtor typically receives a discharge of his debts, even if he has paid less than 100% of the debt, with some exceptions. The first payment under the plan is due 30 days from the date the plan was filed. Are Chapter 13 Plans Based on the Debtor's Income and Assets? Most Chapter 13 plans provide for only a partial repayment of debt. To be approved by the court, the debtor's plan must provide for the debtor to pay to the Chapter 13 trustee a sum equal to the debtor's disposable income for at least 36 months, after taking into account the debtor's regular monthly living expenses. Also, the plan must pay the creditors at least as much as those creditors would receive if the case were in Chapter 7. Thus, the amount that will be repaid to creditors is dependent upon the debtor’s income and assets. The debtor's plan also needs to be filed in good faith. For an appointment in regards to bankruptcy, the law office of Henry Rendler can be contacted at 408.293.5112.